National Food Safety Standards are the only mandatory food standards in our country. It is divided into 10 sections. The section of standards for Nutrition and Foods for Special Dietary Uses as part of National Food Safety Standards mainly refers to nutritional issues of food and foods for special dietary uses. See below. Foods for infants and young children are products designed to satisfy the specific nutritional requirements of healthy infants and young children. They are regulated in China by Infant formula (GB 10765-2010), Older infants and young children formula (GB 10767-2010), Cereal-based complementary foods for infants and young children (GB 10769-2010) and Canned complementary foods for infants and young children (GB 10770-2010). These four standards basically cover various kinds of foods intended for infants and young children. Foods for special medical purposes are a category of foods for particular nutritional uses specially processed or formulated. They intended for the dietary management of patients and to be used under medical supervision. They are used for the exclusive or partial feeding of patients with a limited, impaired or disturbed capacity to take, digest, absorb, metabolize or excrete ordinary foodstuffs or certain nutrients contained therein or metabolites, or with other medically-determined nutrient requirements whose dietary management cannot be achieved only by modification of the normal diet, by other foods for particular nutritional uses, or by a combination of the two. This kind of food is regulated by two standards, Formula for special medical purposes intended for infants (GB 25596-2010)and Food for special medical purposes (GB 29922-2013). GB 25596-2010applies to products for infants and lists six common kinds of products in the Appendix A. GB 29922-2013 applies to products for everyone older than one year of age. Nutrition labeling is a description of information intended to inform the consumer of the nutritional properties of a food. It is regulated by Nutrition labeling of prepackaged foods (GB 28050-2011). 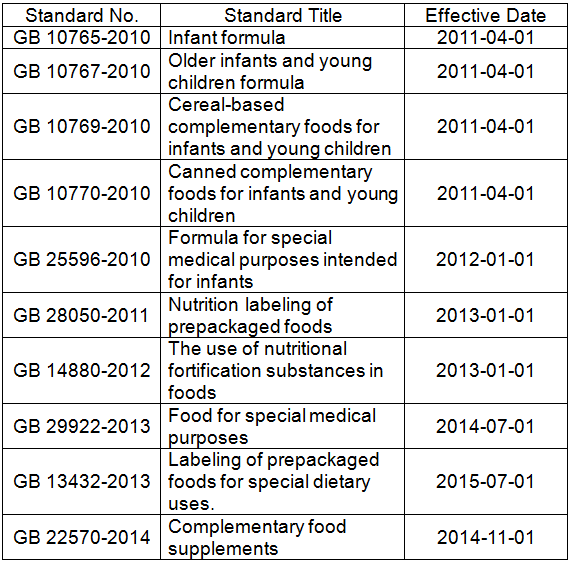 GB 28050-2011 is the first mandatory standard about nutrition labeling in China. According to this standard, nutrition labeling is required on the majority of prepackaged food except some exempt products, such as packaged drinking water. The mandatory nutrition declaration comprises: energy value, protein, fat, carbohydrate, and sodium.Voluntary nutrition and function claims on food also must comply with the GB 28050-2011. However, GB 28050-2011 does not apply to foods for special dietary uses. There is another standard which requires the provision of labeling for foods for special dietary uses. It is Labeling of prepackaged foods for special dietary uses (GB 13432-2013). Food fortification refers to the addition of micronutrients to processed foods.In many situations, this strategy can lead to relatively rapid improvements in the micronutrient status of a population, and at a very reasonable cost,especially if advantage can be taken of existing technology and local distribution networks.Food fortification has a long history of use in our country. Now it regulated by The use of nutritional fortification substances in foods (GB 14880-2012)in which the purpose of food fortification, use of nutritional fortification substances and the vehicle for food fortification, for example, salt or flour, are specified. There are also other foods for special dietary uses, including foods for sport’s people and other specific uses. To cover these products, Complementary food supplements (GB 22570-2014) was published in 2014.